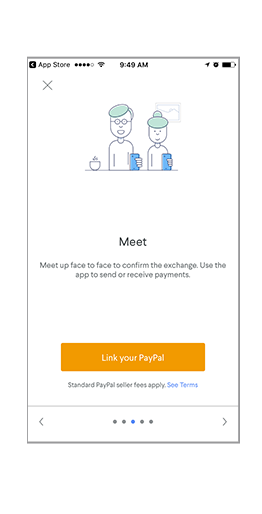 You can now use PayPal at your next Kijiji meet-up to quickly send and receive money through the Kijiji app. Add your bank, credit card or Visa Debit, to your PayPal account and choose how you pay when shopping on Kijiji. Link your PayPal account to the Kijiji app to get started. 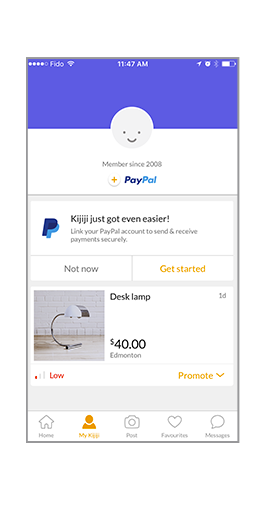 Link your PayPal account to the Kijiji app in the “My Kijiji” page to get started. Meet face to face to inspect the item and confirm the exchange. 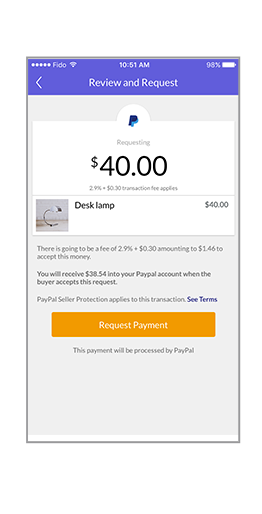 The seller can request payment through Kijiji in-app messaging and the buyer can easily reply by sending a PayPal payment. There is no need to go to the bank or carry large sums of cash. Now when buyers and sellers meet in person and the buyer is ready to pay, payment can all be done through the Kijiji app. When you pay with PayPal through the Kijiji app, you can fund your purchase with your bank account or your credit card, and you can keep earning those rewards points. **Issuer rewards program is subject to the issuer’s rewards program terms and conditions. When you Pay with PayPal through the Kijiji app, you get the security you’ve come to expect from a PayPal transaction. Plus, we don’t share your full financial information with sellers. When you accept PayPal as payment, you are giving your buyers more options which means your items could sell more quickly. All sales with PayPal through the Kijiji app are final. Just like with a cash transaction, there are no refunds and sellers are protected against buyer claims and buyer fraud. See terms and eligibility. Electronic payment processing, credit card fees and seller protection are all included. Pay only 2.9% + $0.30 per transaction when you accept PayPal. See Terms. Download the Kijiji App. Go to the ‘My Kijiji’ page and link your PayPal account to start accepting or paying with PayPal.